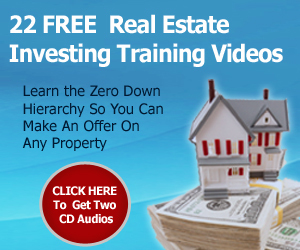 I believe the best way to learn the business of real estate investing is to hear how others have done it. When these interviews were recorded, I asked the interviewer to ask questions that would help the viewer see how these folks got started. I wanted to hear the struggles, the successes and a clear path and explanation of what they had to do to make these deals happen. I did NOT want them to be a bunch of people telling you how wonderful Joe Crump was. I wanted content, examples and real life experiences. John has been building his business over the past few year after joining the mentor program. He got started right out of the gate and made money almost right away. He’s done a lot of deals over the past few years. Listen to how he’s done all these deals, how he’s built his business and how he’s giving back to his family and his community. 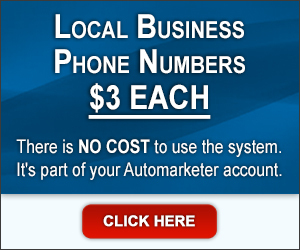 John: My name is John Lomeli and I currently live in Placentia, California. When I first came to Joe’s weekend seminar, boot camp, whatever you want to call it, I was in Sacramento, California, and so I decided to move back home to southern California, where I was born and raised. John: Around 2008 we had quite a downturn in the market, in the real estate market. At the time I owned a mortgage company and I was buying you know, flipping, fixing, selling and was doing quite well. But after the downturn, I lost the mortgage company and although I did have an apartment building that was providing me with some income, I just had to try to figure out a way to get back in to doing the real estate side and I don’t know how Joe got my email, I don’t know if it was something I responded to, and what intrigued me about his method was going automated. And that was something, obviously, that having been in the business for so long, I was used to pounding the pavement, knocking on doors. John: And so automation – wow! You know, how can I learn to do that? And it didn’t take me long to realize that I needed to come out here to Indianapolis and learn what he teaches. 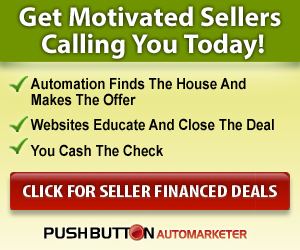 Joe has a system where you actually can reach potential, motivated sellers through basically the internet where automatically emails are sent out or they’re contacted through his automation system and they respond to you if they’re interested. So, that intrigued me because it beats pounding the pavement knocking on doors, obviously, and I wanted to learn it. So I decide to come on out and try to learn. John: I’m a believer in the proof is in the pudding. And I made a call, because that’s what Joe teaches, also, to make the phone calls. And I convinced a seller to let me do a lease option to buy and within thirty days I made five grand. 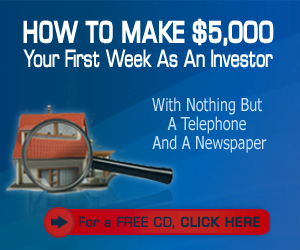 I got $3,000 up front from the buyer and $2,000 in sixty days. It allowed them to move in, the sellers, they had a house basically sold already under the lease option. And I just, I was excited. And I took off from there. So, less than thirty days, or right around thirty days I made my first deal after leaving Joe’s you know, seminar. So, pretty exciting. John: I want to say probably about ten hours, maybe, total. Because I went to go look at the house, I met with the sellers. I explained the process. And then it was just a matter of finding the potential tenant buyers, you know, the rent to own buyers. So, that, to me, after ten hours, is pretty neat. So, making five grand, I mean, who makes that kind of money, you know, working at McDonald’s? Nobody. John: I ended up doing those thirty deals for those investors, two brothers, over a two-year period. So, wasn’t just one deal. It was multiple deals. And from there, I put on a little weekend kind of a seminar. Not really a seminar, but a meeting with other investors who I had done business with in the past who also had that same problem. They had houses they had put in $20K, $30K, into rehabbing, and I got a list of properties that I just, so it was multiple deals that literally became one big transaction for me because it kept me with inventory, good inventory, with homes that had been renovated and I filled those. John: Because of my mortgage background I was able to qualify these people, get the amount of money that was satisfactory for the investors in terms of monthly. I told them how they could, Joe taught us how we could get above fair market rents. It was a win-win. And certainly it kept me afloat because when you’re used to a six figure income and all of a sudden your business is gone? So one deal, no. It provided me with multiple, multiple deals that allowed me to more than survive. John: I was making anywhere between $5,000 and $6,000 per transaction. Some of the investors that I worked with wanted half of the lease option fee, which some I agreed to. And then some just said, you know, whatever you get over and above what I want, you keep. So, it would range, you know, they would vary. But, when you have that much inventory, you learn in this business you don’t get greedy. You know, you take what you can take and move on to the next one. Because when you have a happy seller, you know, and a happy buyer, it’s a win-win. So you just keep moving on. And I’ve had people to this day asking me, “Are you still doing lease options? I’m looking for a house. I still haven’t got my credit right where I want it.” And so, you know, when you do that, and you really want to help both parties, it’s a win-win. You can’t help but get excited over that. John: Just recently I got back in doing deals again. I picked up two deals, actually four deals. I’ve got two in California and two here in Indianapolis. So I was able to not only come here to be with Joe after you know, seven years. I’m back to refresh, you know, my mind and my, the concept and really get back into it again because I know it works. And so, I have some wholesale deals that I’m working on, but I know that using his automation again and getting back on track is going to help me, propel me back up to – you know, you can’t control what the market does. But you have to find ways. If this is what you love, and this is a passion that you have in life, and, there’s your ups and downs, but, it’s important to keep learning and so Joe’s system has gotten better, and I intend to get better right along with it and that’s why I’m here. So, a few deal here, a few deals there, I want more deals. Because obviously at some point I want to be you know, independently wealthy so that I can go ahead and vacation when I want to and do deals, you know, when I’m on the beach somewhere in Hawaii. John: I’ve literally been doing this for twenty-eight years. And again, that roller coaster ride, you can’t control the market, but if you can find other methods and doing what you love and have a passion for, then that’s my goal is, I don’t know that I’ll ever stop, you know, doing some type of real estate transaction. It’s a matter of finding the right system and riding that system out until you can, maybe have to switch gears again. But I think with the automation that Joe teaches, that’s going to allow me to do deals no matter where I’m at, no matter how old I get. You know, so, that’s my goal. And obviously I’d like to be able have that you know, income coming in from those deals so that I can then go ahead and not worry about, you know, when my next paycheck is coming. So it’s a matter of getting back on track again for me. John: Again, there’s, this business is not for everybody and you’ve got to have thick skin and you’ve got to be willing to roll with the punches. The older I get the more motivated I become because I know that there’s a window, a timeframe that I need before I, you know, decide to just do this. Whether I’ll stop or not, I doubt it. After twenty-eight years and obviously being connected with Joe, I really don’t know that I’ll ever stop. So, but that’s my goal. Is it money? Money’s great, but money’s a vehicle. I think what, it, the money allows you to go out and do other things to help people. I’m a veteran. And I want to help homeless veterans. And so with my mortgage background and the possibility of building a nonprofit so that I can get houses and house these veterans, get them, you know, a jump start. That’s my goal. It’s been a passion of mine for quite some time. And I think that’s more of why I’m driving to do what I do. John: The money’s great, don’t get me wrong. I have a great life and money has been there. When you do this business it’s there. But I think it’s more than just the money that drives me at this stage in my life. I’m, I just turned sixty-three and again, it’s been a roller coaster ride. But there’s more I want to do with my life to help others using real estate as a vehicle. John: I think the biggest blessing for me is being in the real estate realm, or the industry, has allowed me to, when my children were small, to take them to school in the morning because I didn’t have an eight to five. I could pick them up in the afternoon. I could pick them up when they got out of school. I could take them to their baseball or practices or games and be there for them as a parent. My parents worked very, very hard but they were at a job. And so I never had the pleasure of them coming to my games when I was playing sports, basketball, football, baseball. I wanted that to be different for my family. John: And their dad was there because a result of what real estate allowed me to do and that’s to work on my time. And of course it allowed me to give them the things that every parent wants to provide for their children. A good home, a good education, you know, so, and hopefully a work ethic that they can see, that if you work hard and work smart, it’ll provide you anything you want in life. And again, what I think I’ve learned more than anything is not just about what it’ll give me, or my family, but what you do to give to others. And so that’s really impacted me a great deal. That’s why I want to keep doing what I’m doing because I know that individually we can make a difference. Together – oh, my gosh! It’ll be a tremendous impact on people like the veterans who need it. John: You know, what if we did a lease option to buy for a veteran knowing at some point they can get, use their veteran benefits to buy a home a hundred percent? But they just need a leg up. Can you imagine that? That’s how it’s impacted me. 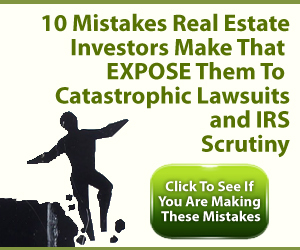 Because I know there’s more out there to helping people with what I can do in the real estate business. John: I’m doing it full time. Yes. Yeah, I am doing it full time. I decided, although I was working for a lender in California as a wholesale account executive, because again, I enjoy the mortgage business. I left the salary and I’m working independent as an outside remote agent, but I didn’t want to be in the office, so in September I resigned my salary position so that I could combine both. Because at some point, the people that you’re doing the rent to own for, you need to be able to help them get the loan eventually so you know, you just kind of, and then the real estate part. If you’re going to be going out to do these deals, you’ve got to be able to find the time. Now, I don’t just want to do it on the weekends. I’m able to go now, take care of the job, so to speak, as an independent contractor, and do my real estate whenever I want. You’ve got to go look at houses after you meet the people. John: Again, Joe teaches it that you can do it the automation way that he teaches and that’s going to help me to do this across the country as opposed to just in California. Again, that is probably one of my shortcomings is, automation. So, yes, do I want to, have I left the job? Yes. Because I know that I want to devote my time totally to doing this full time. So, I made that decision in September. John: I’ve been back here to see Joe, this is probably my fourth time. So, each time that I come I learn a little bit more and I expect to learn even more now and get started with his automation system once again. Again, you know, there’s a lot of ups and downs. It’s nothing’s easy in any business that you’re in and you have to keep up with things. So for me, the automation, once I get it up and running again, get the websites up and running again, I know that it’ll all come back because once you – as a basketball player or any sports that you might play, if you’re down and you’re unable to practice your trade, you lose a little bit of what skills you have. And in the real estate business, it’s much the same. So, for me, that’s why I’m back here. Because I know that this automation will help me now take me back you know, to where I want to be in the real estate business. John: Remember when that hedge fund came in an bought, I was really starting to get, you know, climb again and all of a sudden the rug gets pulled out from under you again. You don’t know what’s going to happen at that point in time, but, with the automation I think it’ll allow me to do other things that Joe teaches as well besides the rent to own, the wholesale, because you can turn them into any type of transaction if you have the knowledge and right now I think what’s lacking for me is the automate knowledge, again, to just kick start my business back to where I want it to be. John: When I started twenty-eight years ago I had no job. I had just gotten married and I was living back in my mother’s house. It doesn’t take money to make money in this business. 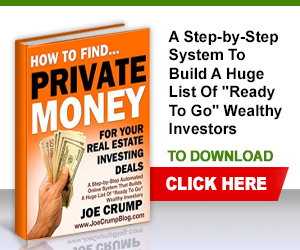 If you learn a method and if you learn a system and if you work that system and you work hard, initially, you can find motivated sellers and you can find investors that will put up the money. I literally found, learned how to do both. 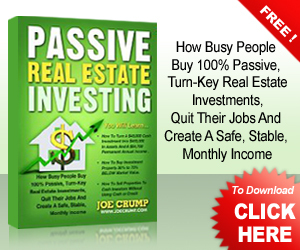 Find the motivated sellers, and find the investors with money to put up the money for me to do transactions. And again, you don’t need money to make money in this business. 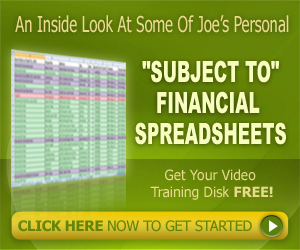 If you use what they call OPM, or “other people’s money” and that’s part of what Joe teaches, too. John: And so I think Joe has been in this business pretty much the same length of time as I have, but boy he has really found a way to help people want to get started and not worry about having their own money. You don’t need it. Get the knowledge first. Get the knowledge. Learn how to approach a seller. 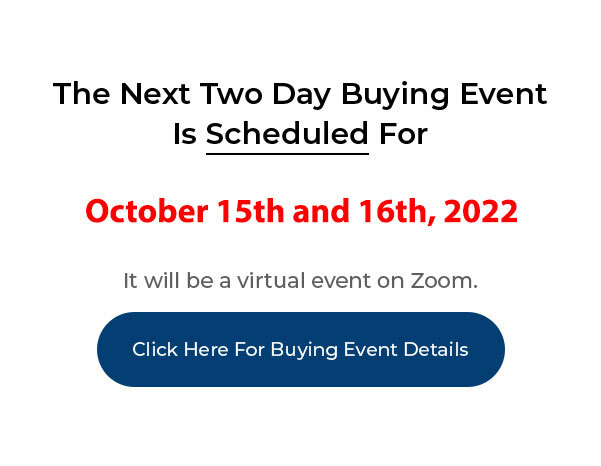 Learn how to approach a buyer. 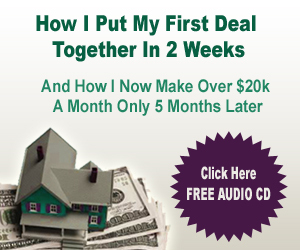 Learn how to put the deal together so that it makes sense and make it a win-win for people. So if you get the knowledge, put forth the effort, okay, and keep working it, keep working it, keep working it, because you’re not going to perfect it at first. The first time I, and again, I’m talking twenty-eight years ago. I knocked on the door, my knees were shaking so bad I thought I was still knocking on that door. John: So you’re going to be scared, you’re going to be intimidated. You’re going to not, you’re going to worry about what you’re saying or what you’re not saying. But by golly, if you just keep at it, you’ll be confident, you’ll learn it, and take Joe’s system, okay, because if I had learned this twenty-eight years ago, my guess is things would have been a little bit different for me. But it doesn’t matter. If it’s what you want to do, obtain the knowledge. Learn from Joe because he preaches and does what he says. He doesn’t just preach. He does everything that we, he’s teaching us to do, he does it. And it works. I’m living proof of that, or I wouldn’t be back here seven years later. So just go for it. That’s all I can tell you. That’s like the NIKE™ commercial says, “Just Do It!” Don’t worry about how much money you have or no job or where you’re living or where you’re at. Just learn and run the race. John: You know, I’ve said probably quite a bit and I think you can tell that I’m very passionate about this business. And it will make a difference in your life. And not just that, it’ll help you, it’ll help your family. But I think what I would venture to say is take what you learn, make a tremendous amount of money because you can, and then go out and help somebody else. 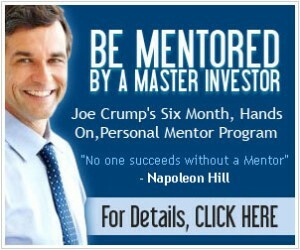 I think that mentoring is part of what Joe’s passion is as well. Because he wants to see other people succeed and I think that we in turn, if we can make a difference in someone’s life because of what we’ve been blessed with, I would say find a “why” and then go out and do it. Find what motivates you and hopefully you’ll find that being in this business will in fact impact your life as well as the life of your family and hopefully others. Can I Join Your Mentor Phone Calls? Will You Partner With Me If I Join Your Mentor Program?